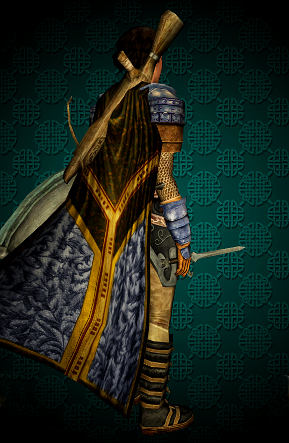 Gwaewen joined the gang around the same time as Calairiel, to add woodworking to the group’s crafting abilities. She makes good bows when none are elsewhere to be found; spears and clubs sometimes, too. She is a human guardian. 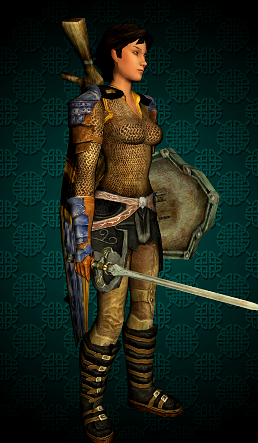 As you can see, I like the Outrider Leggings as a versatile standby piece early in the game. 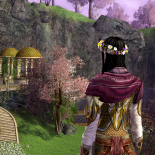 This entry was posted on 2014.03.21 by vyh in Outfits and tagged black, blue, brown, cosmetics, elendilmir, guardian, gwaewen, lord of the rings online, lotro, navy, outfits.